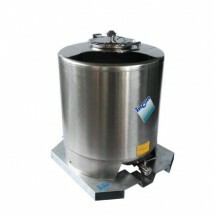 SBP1000 AISI 304 1.5mm Palletised Stainless Steel IBC Tank for storage and internal handling. (Recommended for brewing industry). New multi-use 1000 litre capacity palletised tank for storage and internal handling. Special Features: ergonomic shaped base with slots for fork lift truck and manual pallet truck handling. Deep drawn shaped outlet area to maximise full product discharge. AISI 304 internal finish BA external finish satin. 400mm diameter manhole with lid and clamp closure/ball or butterfly outlet, max diameter DN50 (2")/ pressure relief valve. Cold forged bottom covers with optimised shape, minimum thickness 1.5mm. Robotised TIG welding process. Pickled and passivated seams. Bath galvanised, stainless steel palletised base (painted on request). Stainless steel ring welded to the tank and screwed to the base. On request: available in steel inox AISI304.